NVIDIA's GeForce GTX 1660 Ti's new TU116 GPU is a brand new design specifically for the mainstream gaming market. Manufactured using TSMC's 12nm FinFET technology, it incorporates 1560 'Turing' CUDA Cores arraigned in a Shader Module that differs considerably from that of the RTX 2060. Without both Tensor and RT Cores it lacks hardware support for NVIDIA RTX Hybrid/Real-Time Raytracing and AI features such as DLSS, but does roll in other improvements specific to the Turing architecture. 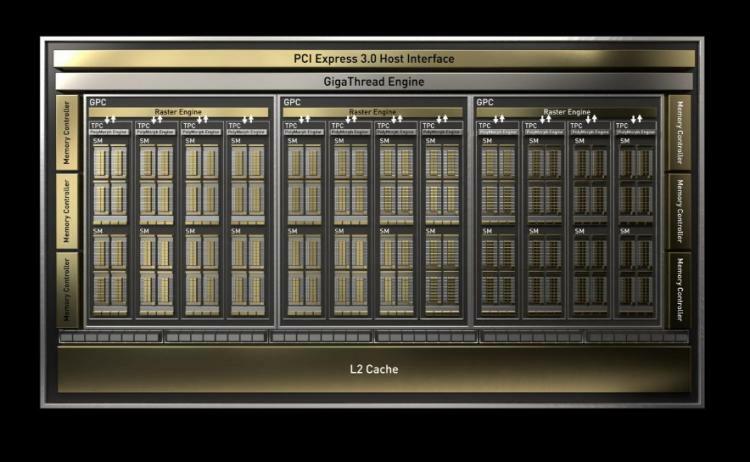 Turing moves to a Unified L1 Cache, a schema which offers lower latency, higher bandwidth, and higher capacity compared to Pascal and earlier architectures. NVIDIA describe the design as featuring a more 'heavyweight' shader thanks to a 3x increase in L1 Cache Size (from 48 to 128 KB) and 4x increase to L1 Cache Bandwidth. These changes are likely to have a high impact on effective shader Instructions Per Clock, even without accounting for game engine optimisations that take advantage of new dynamic cache allocation features and support for larger data structures. Simply increasing the cache size will increase the chances for a cache 'hit', reducing how often slower cache and memory needs to be accessed. NVIDIA's Pascal architecture is capable of executing both Floating and Integer operations, but only sequentially across the shader module by switching between the two modes. Turing shader processors by contrast can execute batches of mixed operations in parallel, greatly increasing total operations per second in mixed workloads. 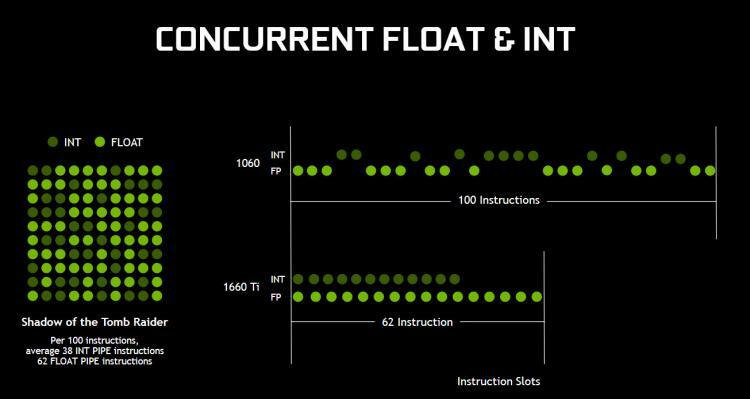 While floating point operations have tended to dominate game engine workloads, modern titles are beginning to roll in integer operations where it's deemed appropriate as GPU hardware broadens its mixed workload capabilities. As a result the GTX 1660 Ti has a certain amount of future-proofing when compared to a GPU from an older generation with similar performance characteristics. Sections of any rendered scene will differ in complexity, from heavily textured objects and surfaces to more plain walls with less detail. From frame to frame large areas with less detail may change very little over time. Adaptive Shading techniques are aware of that contextual difference, and can allocate fewer shading resources to these zones dynamically. Adaptive Shading is one aspect of Variable Rate Shading possible under the RTX technologies umbrella. It's not clear which aspects won't be possible with the GTX 16-series, but that will no-doubt become clear as it is used in more games. For now, Adapative Shading is present in Wolfenstein: The New Colossus, and is a factor in the NVIDIA's projection of a 1.4x performance advantage vs the 1060 6GB. The new VirtualLink VR connector standard is a optionally available on the GTX 1660 Ti. We already know of a number of partner cards which will not be incorporating the I/O connector, so approach each on a case-by-case basis if it is important to you. From a pure performance perspective the GTX 1660 Ti should be more than capable of current Premium VR rendering support as its anticipated performance exceeds that of the already-validated GTX 1060 6GB. 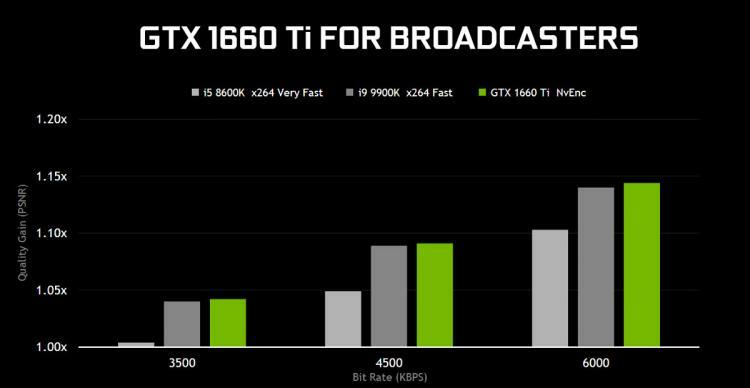 The GXT 1660Ti supports NVIDIA's latest NvEnc hardware video encoder. Designed specifically for game broadcasting via Twitch and other streaming platforms, it improves the video stream (x264 fast) encoding bit rates to up to 6000KB/s. Video quality is also improved, now exceeding that of an Intel Core i9-9900K using the same encoding while also offloading processing from the CPU. OC Scanner was introduced alongside the RTX 20-series cards as a means of offering automated (one-click) overclocking for a 'free' performance boost, and has since been extended to older NVIDIA GPU architectures. It works by scanning for artefacts and other inconsistencies as operating frequencies increase, easing off when detected and failing safely rather than causing hard lockups. OC Scanner is now incorporated into the major aftermarket overclocking tools from EVGA, MSI and ASUS. Currently Turing GPUs are manufactured using TSMC's 12nm lithography, which has many similarities the GTX 1060 6GB's 16nm manufacturing process. Power efficiency improvements will tend to be down to architectural changes rather than the manufacturing process, but higher frequencies on similar voltages aren't out of the question. NVIDIA boast of a 1.4x perf/watt improvement in optimal workloads over the GTX 1060 6GB, which is more than just a little significant. The GTX 1660 Ti has a reference TDP of 120W, the same as the GTX 1060 6GB, which speaks to the expected performance improvement you might see when comparing with the previous generation. Most GTX 1660 Ti's will ship with a single 6-Pin PCIe connector, but some (such as the ROG STRIX GTX 1660 Ti) are equipped with an 8-pin connector for a little more overhead. The GTX 1660 Ti is the first mainstream GPU to be configured with GDDR6 memory, a standard that until now has been exclusive to performance class RTX 20-series GPUs. An effective memory speed of 12000Gbps compares very favourably with the GTX 1060 6GB's 8000Gbps, increasing the available memory bandwidth by 50% to 288 GB/sec.